The little robotic waiter wheels up to the table, raises its glass lid to reveal a steaming plate of local Shanghai-style crayfish and announces in low, mechanical tones, "Enjoy your meal." The futuristic restaurant concept is the latest initiative in Chinese e-commerce giant Alibaba's push to modernise service and retail in a country where robotics and artificial intelligence are increasingly being integrated into commerce. Raising efficiency and lowering labour costs are the objectives at Alibaba's "Robot.He" diners, where waiters have been replaced by robots about the size of microwave ovens, which roll around the dining room on table-high runways. "In Shanghai, a waiter costs up to 10,000 yuan ($1,500) per month. That's hundreds of thousands in cost every year. And two shifts of people are needed," said Cao Haitao, the Alibaba product manager who developed the concept. "But we don't need two shifts for robots and they are on duty every day." [post_ads]The diners are attached to Alibaba's new Hema chain of semi-automated supermarkets, where grocery shoppers fill their "carts" on a mobile app and have the merchandise brought to them at checkout via conveyor tracks on the ceiling, or delivered straight to their homes. 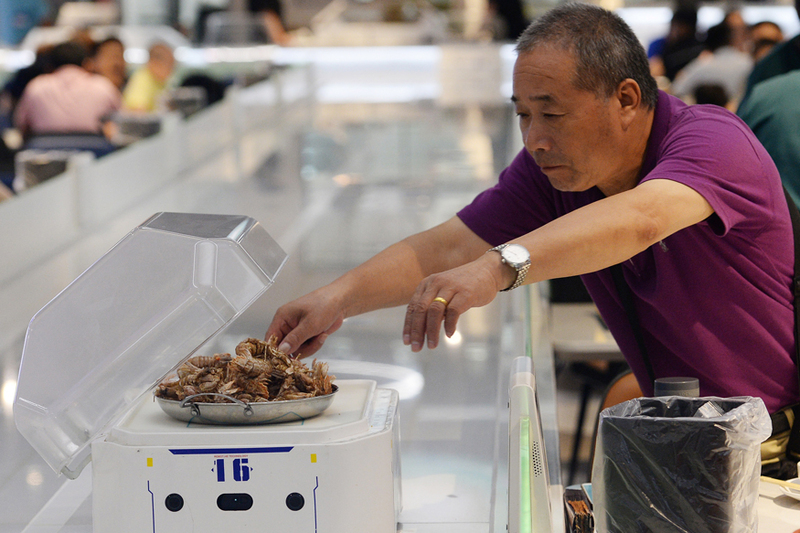 Alibaba now has 57 Hema markets in 13 Chinese cities, all of which will eventually feature the robotic restaurants. Industry experts say they serve more as showcases of Alibaba's tech prowess than a serious business model in a country where labour costs are relatively low. But the restaurants also typify the rapid adoption of new technologies in a country where the government is increasingly using facial-recognition technology to police streets and identify law-breakers. Alibaba's e-commerce rival JD.com has announced plans to open 1,000 restaurants by 2020 in which food will be prepared and served by robots. JD.com and others are also working to incorporate airborne drones into their delivery networks. The movement could help companies reduce costs as growth rates in China's e-commerce boom begin to plateau. "Before, everyone was all going for rapid expansion. Now the growth is gone and everyone has to focus on improving their operations," said Jason Ding, a China retail expert with Bain & Company. "Operation is all about cutting costs and providing better service. So these automated machine technologies, in the right place, can play a role there"
At Robot.He, customers book tables and order entrées via apps, and the diner's novelty often draws long queues. Ma Yiwen, 33, brought nearly a dozen colleagues with her. "We are all foodies and we use our lunch time to try good food near our office. The idea of a robot delivering food to our table is very innovative so we wanted to see it ourselves," she said. The restaurant says automation helps keep costs down, an additional lure for 20-year-old customer Ma Shenpeng, who comes once a week. "Normally for two to three people, a meal costs about 300-400 yuan, but here, all this table of food is just over 100 yuan," he said. But it's a delicate issue for Chinese policy-makers due to the potential for human job losses, and the government is in the midst of a long-term push to develop the country's services industry partly as a job creator, as manufacturing increasingly becomes mechanized. Wang Hesheng, a robotics professor at Shanghai's Jiaotong University, said the cost of robots remains too high for widespread consumer use and that many companies were merely jumping on the government's high-tech bandwagon. But robotics could spread if China labour costs continue to grow, he said. "Maybe when labour costs rise higher and higher, robots will balance out with humans," he said.